My little pumpkin pie is the happiness of my life right now. Her name is Kiki (yes she loves me, yes she's ridin - sometimes, only when she feels like it - and NO she wasn't named after the song) and she came into our lives in 2011 when she was just a few months old. 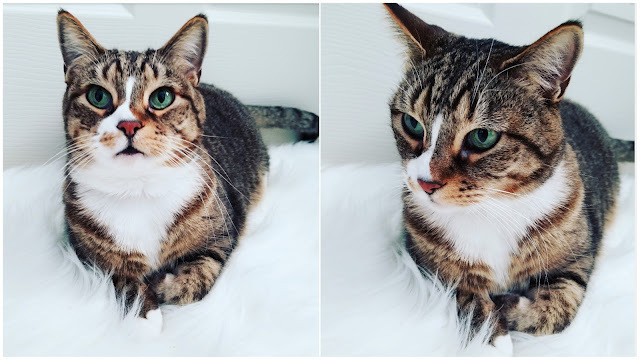 Her birthday (we think) is October 13, 2010 so she is fully 8 years old now but acts like she's a kitten. She is full of light and comfort that I honestly don't know what I would do without her. She is there when I'm crying - even though she doesn't like it, she will sit still and let me cry. She is very playful and even more playful on catnip! She lets me pick her up and squeeze the heck outta her, even if it means that it annoys her. I have found that our personalities are quiet similar in the fact that we are very selfish, picky about being clean, and cuddle only when we want to. Cats are very boss animals and don't let anybody walk all over them and that is truly what I admire about them. She is also very smart and learns on her own without us having to teach her anything. Like the fact when I say 'hajmo vani' (let's go outside), she runs to the door and starts meowing. Oh she knows. Or the fact when I say 'gdje ona?' (where is she? ), she starts running at the speed of light because she knows it's time to play. My boyfriend will argue that dogs are smarter, but only because they are taught certain things. I argue that cats are smarter because they learn on their own. I wanted to make a post about her because she is very special to me and holds a dear place in my heart. I also wanted to share with some of you what I have bought for her and what we have used to feed her and whatnot. 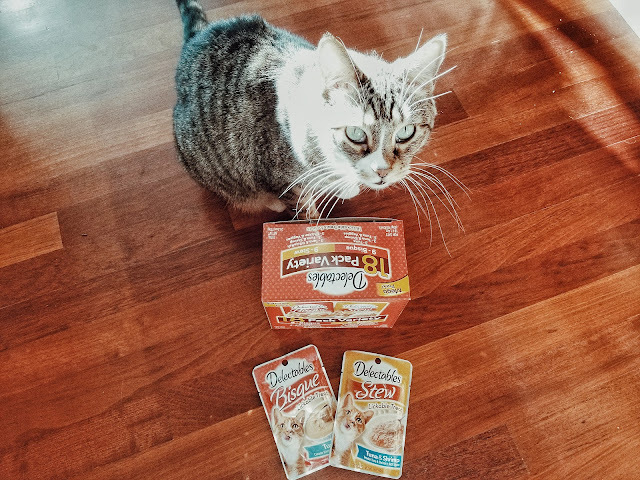 The food we give her is Purina Cat Chow Naturals Original With Real Chicken & Salmon Adult Dry Cat Food. 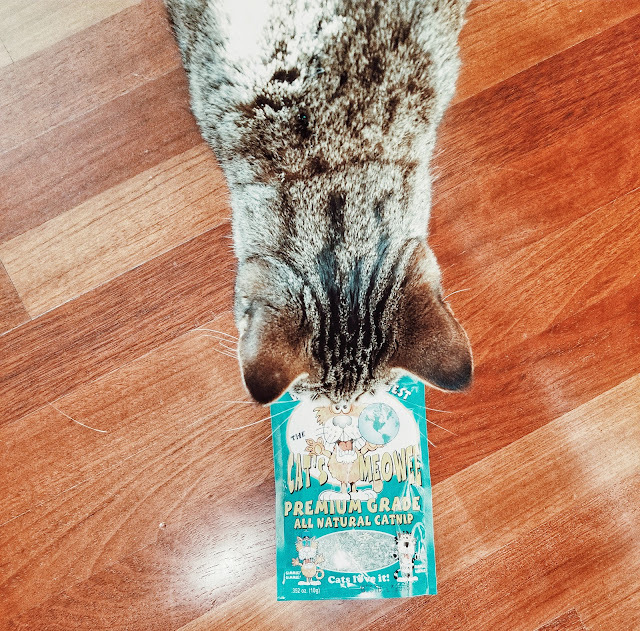 She is a very picky cat and will not eat certain foods but this food she loves. 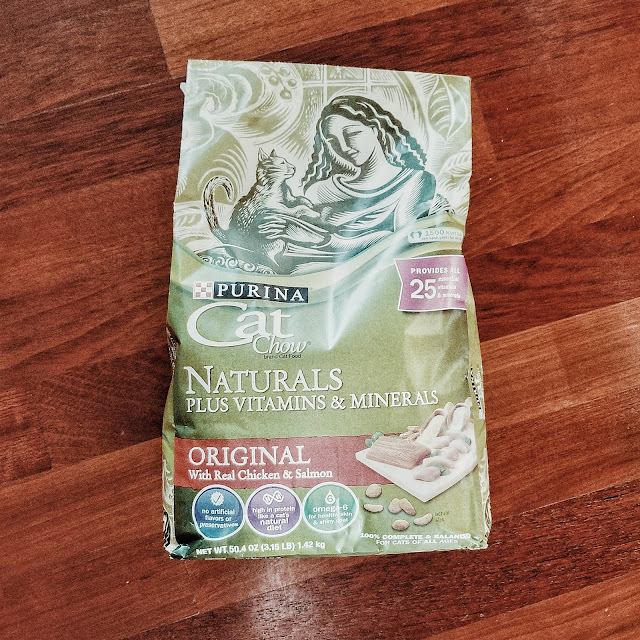 I love that it's the naturals of Purina collection because although it's not 100% organic, it is somewhat healthier for her. She is only 9 lbs and we want to make sure she stays that way. She is a "self feeder", meaning I can leave out the whole bag and she will only eat like 5 pebbles and come back again later when she's hungry. Throughout the years, I've noticed that she prefers chicken and is ok with fish too but not a big beef fan. This is the wet food that we give her on occasion. Like I said, I don't want her to get overweight so I don't give her too much food, but I swear that if I had a gallon of this stuff, she would eat the whole thing. Something about wet food makes her super happy and she could eat it all day everyday. 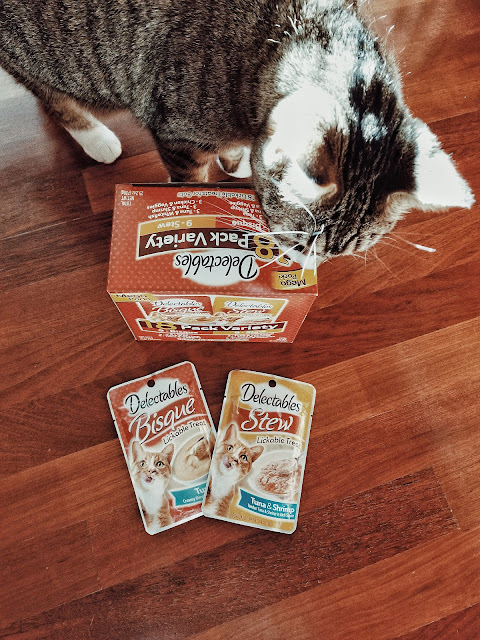 I recently bought this Delectables Stew from Amazon and she has been OBSESSED with it. As soon as she hears me touching the box/pouches, she runs towards me because she knows what's in there. We've tried to feed her the solid wet food out of the cans and she just won't eat them. These I like better because she likes them and it comes with a little bit of food so she won't be overweight. I would say we feed this to her a couple times a week.